Many of the latest digital devices including tablets, smartphones and other DV devices now come equipped with the compact microHDMI™ port. 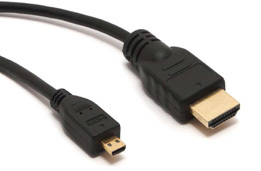 This port, being smaller than standard HDMI connectors, means any device equipped with MicroHDMI™ can output to any HDMI™ TV, monitor or projector. The new LMS Data C-HDMIM-HDMI solves the problem of connecting your MicroHDMI™ device to full HDMI™ displays for example. Simply connect to your digital device, the other end to any 1080p, 3D-HD TV or monitor and enjoy high-definition video and audio. Manufactured to the very latest HDMI™ specifications, the C-HDMIM-M supports 1.4 specifications to support high-bandwidth 3D output*, deep colour (48-bit) support for superior colour depth and clarity and support for DolbyTrueHD™ audio. What's more, ACR (audio channel return) is supported for combined audio and video* for a great multimedia experience, for pleasure or business. Robust in design for long-term use, the C-HDMIM-M is a lightweight and flexible design so is ideal for tablet and smartphone usage and the goldplated connectors enable better signal conduction and at the same time reduce any corrosion which may reduce signal quality over time.